Unless you have otherwise been instructed you can continue with your normal diet. Wear loose comfortable clothing, all items of jewellery including watches need to be removed. We recommend you leave valuables at home wherever possible. Makeup products and hair products (spray, gel etc) should not be worn. The patient is positioned on a table which slides inside the magnet tunnel. Intermittent series of knocking noises can be heard throughout the examination. It is important that the patient remain very still during the examination. If called for an injection may be given to enhance aspects of the images obtained. 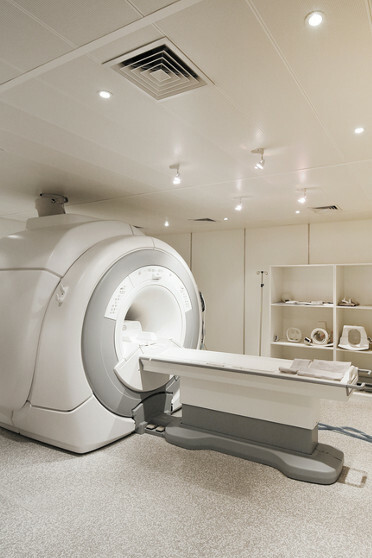 Patients cannot undergo an MRI if they have certain types of metal/electrical implants such as: pacemakers, neurostimulators, ear implants and clips in the eyes. Patients who have used welders or grinders may be required to have an x-ray of their eyes first to ensure there are no metal particles lodged in them. People who experience feelings of claustrophobia may find this examination challenging. If you would like to discuss ways to make the examination as pleasant as possible please feel free to call us between 8:30am and 5:00pm Monday to Friday or email mribookings@bundyrad.com.au at any time. An examination typically ranges between 30 and 60 minutes.